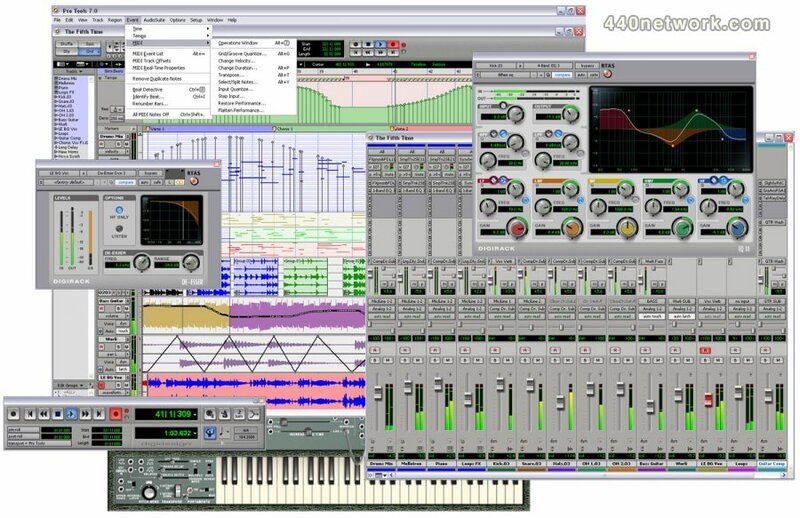 Pro Tools LE software offers an unparalleled breadth of creative options when developing ideas. Easily import audio and MIDI files and loops. Take advantage of an unmatched range of unique, non-destructive audio editing tools like Beat Detective LE, enabling you to automatically correct timing on individual tracks. Develop MIDI compositions with Pro Tools' integrated, easy-to-use MIDI sequencer. Choose among a wide-range of instrument and effects plug-ins to develop the sounds you're after, or integrate your favorite ReWire-compatible applications right into your mixes. Pro Tools LE systems with Pro Tools LE software offer superior features and functionality to capture ideas quickly and easily. Choose the professional-sounding Pro Tools LE hardware interface to perfectly suit your recording needs (Mbox 2, Digi 002, or Digi 002 Rack). Use loop recording to capture several takes of a solo. Set an automatic punch-in/punch-out range to effortlessly fix a passage. Even create individual cue mixes for everyone in the recording session. Pro Tools LE software offers the ultimate in mixing power and flexibility. Choose among a variety of professional plug-in effects to develop a mix. Take advantage of the most powerful automation in the industry to add motion to your music. Put more real-time plug-ins to work in your sessions via improved RTAS plug-in performance. Finally, connect a control surface such as Command|8 to your system and enjoy the familiar feel of a tactile faders and controls when mixing. When you work with Pro Tools software, you're working with the standard for professional audio production. Enjoy full compatibility with countless Pro Tools–equipped professional and personal studios around the world. Exchange entire sessions, individual session elements, or stereo mixes for easy collaboration with your friends. Plus, export to numerous other standard audio file formats, including MP3. * Mac computers would kernel panic (crash) on shut down if the computer was started with an Mbox 2 USB device (Mbox 2, Mbox 2 Mini, or Mbox 2 Micro) attached, and the Mbox 2 is disconnected prior to shutdown. * With 003, 003 Rack, 003 Rack+, Digi 002 or Digi 002 Rack, Core Audio Manager would always default to 48kHz after setting it to 44.1kHz and closing the Core Audio Manager. This would cause unpredictable results with 3rd party applications. 88.2kHz/96kHz were not affected. * In some cases on OS X, Pro Tools LE would post a DAE -9136 error during playback with Mbox. This issue did not occur with Mbox 2. * The operating system becomes unresponsive (spinning beach ball, freeze, or "kernel panic" message), requiring a restart of the computer. * This fix eliminates many, but not all instances of error -9136 during playback with the original Mbox on Intel-based Macs. Please Note: Connecting or disconnecting an interface while the computer is turned on (hot swapping) can also cause problems with the operating system, such as "You need to restart your computer" (kernel panic) messages. This is a separate issue unrelated to the fix listed above. Hot swapping is not recommended with any audio interface, particularly when that interface is being used by an application. * Pro Tools would crash when accessing the Hardware Setup dialog with VENUE FWx card connected. * When using Pro Tools 8.0cs1 or higher with Video Satellite LE, all connected satellite systems must be running Pro Tools 8.0cs1 or higher. * Pro Tools 8.0 cannot be connected as a satellite to other systems running Pro Tools 8.0cs1 or higher. Pro Tools LE® and Pro Tools M-Powered users now get 3x (!) more audio tracks (up to 48 simultaneous stereo or mono tracks) than previously to create larger, more complex mixes. The new Expand To New Tracks By Time Code Only feature lets you expand a track or selected region to new tracks, revealing all other regions recorded at the same time code location, regardless of channel name or number. Please Note: Time code features in Pro Tools LE require optional purchase of DV Toolkit 2. This would occur if the preference "Default Region Color Coding" was set to "Marker locations." After focusing to a new plug-in, the top row of the scribble strip would reflect the new plug-in, but the bottom row display and controls would continue to be focused on the previously selected plug-in. The workaround was to unplug/replug the Mbox 2 Pro after booting the computer. With "RTAS Processors" set to "4 Processors," increasing the Hardware Buffer size would reduce the availability of RTAS plug-in instances. Pro Tools would not allow a session with a 2-hour start time to overlay automation data on a session with a 1-hour start time without clearing all automation before 2 hours on the destination session. Automation cannot be "combined" with an overlay - the destination session's automation will be replaced from the Session Start time of the source session. Inserts and sends must be consistent between sessions or they may be overwritten. Volumes with Japanese naming will not mount in DigiBase and will not allow you to create a Pro Tools session without an error. This would result in an assertion error. Note that this problem only occurs with Intel-based Macs. The quit would occur after the Pro Tools icon bounced in the dock for a while. The installer was not setting permissions correctly for the enabler files. In "Write" mode, breakpoints were not being created on "start" and "stop." This would occur after an instantaneous automation change, such as what using the trim tool might cause. Flicker could occur on stereo meters when tracks were set to "no input" with pre-fader metering disabled. Note - this does not occur with single processor RTAS setting. The "fine-tune breakpoint" Command key functionality has now been restored to the pre-Pro Tools 6.9 behavior. The key command for "Write Level Constrained to Next Breakpoint" (new to 6.9) has been changed from "Command-click" to "Option-Shift-click." The key command for "Write Level Constrained to Previous Breakpoint" remains "Command-Option-click". 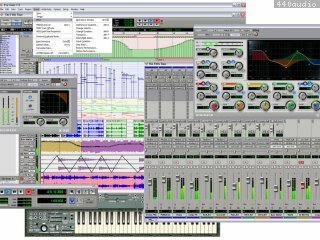 Pro Tools LE 6.2.3 is a maintenance release including SCSI qualification with Power Mac G5 and Power Mac G4. Adds support for Power Mac G5s with OS X 10.3.1 to Digi 002, Digi 002 Rack, and Mbox. Other new compatibility includes Mac OS X 10.3.1 with Digi 002, Digi 002 Rack, and Mbox to currently shipping PowerBooks, iBooks, iMacs, and shipping Power Mac G4s. The updates for MP3 Option, DV Toolkit, and DigiTranslator owners are included in the Pro Tools LE 6.2.2 installer. Pro Tools 6.0 software for Mac OS X adds a powerful set of new features and improvements that make this the next evolutionary step for Pro Tools software. With Pro Tools 6.0, you'll experience a completely new level of efficiency and effectiveness when working with Pro Tools. Premier amongst new features is support for Apple's OS X operating system, providing improved, solid interaction between the Pro Tools environment and Power Mac G4s. You'll also notice a streamlined new look for the Mix, Edit, and Transport windows, making this the most user-friendly Pro Tools software environment yet. New multi-user login functionality enables individual users to save custom display, operation, editing, automation, processing, compatibility, and MIDI preferences, providing a new degree of personalization with the Pro Tools environment. But that's just the beginning. Pro Tools 6.0 software also features the amazing new DigiBase file management utility, enhanced MIDI functionality (including hi-res groove templates! ), additional Beat Detective features, new Import Session options, plug-in functionality enhancements, MachineControl additions, and much more! * Pro Tools LE would hang on "DAE Loaded" while launching when connected via FWx card. * Pro Tools LE for Windows cannot access Hardware Setup dialog with VENUE FWx card connected. When creating tracks with the New Track command, the Track Timebase (samples or ticks) will default to the timebase that was last used for the track type in the New Track dialog. In addition, when creating new audio tracks with the Import > Audio to Track command or by dragging audio files into the timeline, the Track Timebase (samples or ticks) will default to the New Track dialog's last used timebase for audio tracks. Exceptions are tick-based file formats (such as ACID and REX files), which will default to ticks. Pro Tools LE 7.1 and Pro Tools M-Powered 7.1 can be installed on the same Digidesign-qualified computer. Co-installation is only supported when Pro Tools LE and M-Powered have the exact same version number. Mines OK and yes ADC please Digi!!!!! Ever since version 7.4, MIDI timing is completely messed up. All MIDI notes do NOT hit where they're supposed to and has become consistently randomized. This was not the case with 7.3, and I hope they fix it QUICK! Until then, I'll be fine running Ableton Live 7. Le seul séquenceur que j'arrive à oublier quand je bosse dessus tellement c'est intuitif, puissant, détaillé, souple, magique. Les instabilités ont presque disparu (mais ça reste sensible sur les plugins bizarres ou mal installés) sur une machine dont la maintenance est faite correctement. Le CoreAudio et ProTools s'entendent à merveille maintenant ! Bref, le top pour l'audio, même si ça pêche un peu côté MIDI (pas tant que ça non plus quand même). Tous les bugs ne sont pas encore corrigés dans cette version (fréquents plantages, lors des changements de réglages DAE ou avec certains plug-ins). Une impression d'instabilité et une gestion peu aisée du driver (difficile d'optimiser les buffers pour un bon rendement latence/traitement). On est encore loin de la souplesse et de la robustesse de PT LE sous Mac OS 9. Très instable si le Mac est sur réseau (via éthernet et/ou airport) ce qui n'était pas le cas sous 6.1.1/OS 10.2.6. Le pilote coreaudio est pour l'instant quasi-inutilisable. Parmi les nouveautés, bravo pour le support Rewire (déjà là sur la 6.1). A quand un vrai Time-code pour la post-prod vidéo (je suppose qu'il faut acheter l'option à un million de dollars ?). Après avoir testé Cubase SX, Logic Audio 6 et Digital Performer 4, je reste attaché à Protools pour la sobriété de l'interface et l'éfficacité de l'édition audio mais suis de plus en plus tenté d'acquérir Logic Audio dont tout semble indiquer que son intégration Mac OS X (rachat Apple oblige), sa compatibilité multi-support (drivers audio et plug ins VST, RTAS, AU) qu'il s'annonce comme un incontournable sur Mac.